We've all seen the images on news, some figures estimate the "marsh" to be around 700 k people. All marching to "Save the country from Brexit"..But what is the real truth? Rich psychopathic leaders of the 4th Reich (The EU) German Chancellor Angela Merkel and French PM Emmy Macron, With the help of billionaire Ed Miliband. Have been complicit in financing the fake protest to give an allusion to the world that Brexit isn't wanted anymore, so they can keep their hands in the great British people pockets, forcing left-wing fascism on our children. The people have spoken, Brexit is the past, the present and the future. According to a recent poll created by the Sun. 94% of the people of Great Britain support a no deal Brexit as soon as possible. Did your other username write this? 700,000 according to the organisers. It’s a shame they didn’t show the same enthusiasm during the referendum and marching to the polling booth. That's what Debbie McGee use to mutter to herself as she knelt down to blow Paul Daniels. He looks like he's getting dressed to go on an adventure with a magic ring. "Kiss the magic ring goodbye, Debbie"
On a serious note it’s no wonder the police are struggling for money if they have to send thousands of officers to police several random marches every day. These marches are getting a bit too much now. Yeah that’s just a ridiculous waste of public money. Well done to all the marchers. Feck Corbyn the shite house. Dont p@ss about with peace in Europe. Eh! What is the significance of the picture, is there one or am I missing something?! It's a new internet meme created by the Alt-Right. 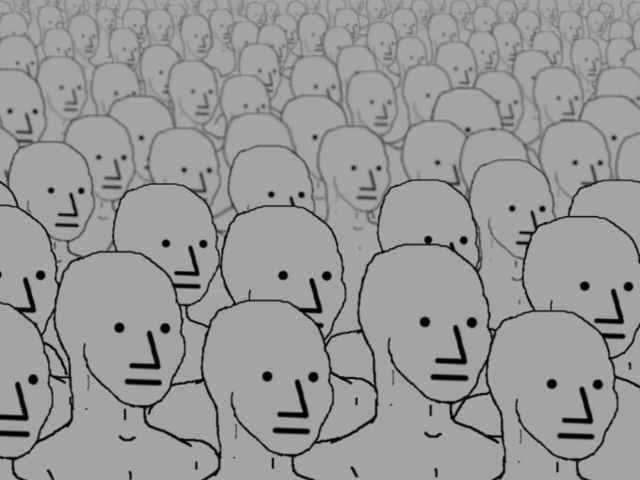 With the hashtag "Orange man bad" which is supposed to poke fun at "Lefties", Portraying them as zombie like grey figures that keep repeating the same liberal cliches "Diversity is good/ Black lives matter" etc..because they're too brainwashed by liberal media to think for themselves. ".because they're too brainwashed by liberal media to think for themselves." Hey, Omar, remember that time you made a post about how Matt Bellamy and all the other celebrities were left wing as some sort of argument against the right? Has Matt given you any more political wisdom? Our resident maker of fake hate crimes has failed to grasp the proper meaning, DJack. In a computer game there are NPCs which are sort of like extras in a film. You can't play as them and they're often programmed with a few stock phrases. People started noticing that at rallies where you would find SJW's and their ilk they would be shouting things like "Impeach Trump" when asked why they would go blank and just stare. Almost like they didn't compute. Like the answers had not been programmed. People started asking the much needed question, a question that probes at the very nature of our reality, are these empty headed freaks actually real life non player characters? The SJW'S then had a big cry about how this dehumanises them. Yes, the same people who've spent the last year calling everyone who disagrees with them a Russia bot...those people. Pathetic and childish? yes. But nowhere near as pathetic as making a fake user name to racially abuse yourself for victim points, of course.